I guess the guy in the yellow shirt must have stolen something because a mob was chasing him down. He fell down in front of my window and people started kicking him and stamping on him. The big guy holding him by the shirt possibly saved his life and definitely saved him from getting even more beat up. He pulled everyone off the guy and made people calm down a bit. The security guy with the rifle and the red sleeves also helped calm things down. 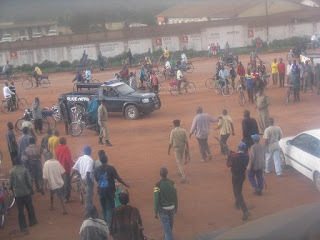 When the police arrived they dispersed the crowd and drove the thief to jail.